Katherine Hall was born in Denver, CO and graduated from Pomona High School in Arvada in May 2007. 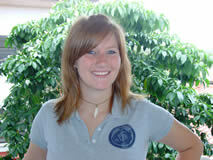 She is currently a second semester freshmen at UH Hilo majoring in Astrophysics and minors in both math and physics. Katherine’s favorite activities involve playing tennis, working at the local planetarium, biking and volunteering at the Mauna Kea Visitor’s Station. Katherine hopes to continue through college to earn her Ph.D. in astrophysics and work at JPL or do intergalactic space research. Katherine is very excited to be working at the 1 meter UHH telescope this summer. In September 2008, a new 0.9-meter telescope will be built on the 4000m summit of Mauna Kea for University of Hawai‘i-Hilo students. Two important aspects of any new telescope are the software that will control the motion of the telescope and webcams that will monitor the telescope’s actual operations. Laboratory Virtual Instrument Engineering Workbench (LabVIEW) will be used to control the movement of this telescope. Using LabVIEW, we will create a more user-friendly control system for the students to use. Instead of using text-based computer codes, LabVIEW uses a graphical programming environment with icons to create a program to control the telescope’s motion. LabVIEW programs are more easily interpreted and have greater potential for problem solving than text-based computer programs. The current focus at this time is to design the controls for the telescope’s motion and create a graphical representation of the telescope’s and shutter’s motions. Another goal of this project was to program and test the software used to control the several webcams at the site. An exterior camera will be used to monitor the construction site, with later use for weather monitoring. UH-Hilo will also be using several interior webcams as visual verification of operations inside the dome. By using webcams inside the dome, students will be able to watch out for any possible obstacles that may occur. With these two important aspects of the new 0.9-meter telescope, students will be able to control the telescope efficiently and effectively.